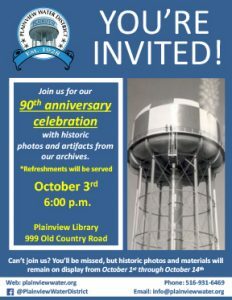 Plainview Water District Celebrates 90 Years of Delivering Quality Water and Service to the Plainview Community. Historical Photos and Items to be Displayed at Plainview Library October 1 – October 14. Community Reception to be Held on October 3 at 6:00 p.m. In an effort to provide insight into the District’s earlier years, a visual display of old photos and other historic items will occur at the Plainview Library between October 1 and October 14. In addition, on October 3, 2018 at 6 p.m., the District will be hosting a reception at the exhibit and all family, friends and members of the community are invited to attend. For more information, please contact the Plainview Water District at (516) 931-6469, info@plainviewwater.orgor through the District’s website www.plainviewwater.org. The District also encourages all residents to sign up for email updates to stay better informed about District activities.